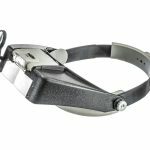 The perfect addition to the birthday of a hunter, outdoorsman or redneck in your family. 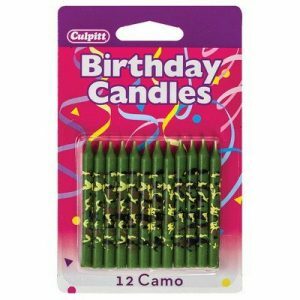 These cute camoflage birthday candles are sure to be a hit at your next birthday event. The candles measure 2 1/2 inches tall and come in a pack of 12. There really isn’t much more to say about these. They are candles for heavens sake. I really like these candles but wonder if anyone even noticed I went the extra mile to use them? They are candles. They burn. So I guess that warrants a five star rating. The camo design is cool, my son really loved them. I bought these for a party we threw for a friend who is in the military. I think it was his most favorite thing of the whole evening!!! 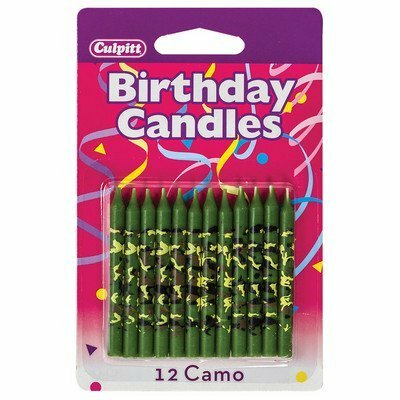 Definitely worth the slightly higher price than normal birthday candles just for the fun.